All the products on Magnet Montreal are available online and in store in Montreal. Our store is open to the public, you are welcome to drop by to make your purchases. All products are on demo in store, our qualified staff will be glad to answer your questions. The store will be closed on the Easter weekend from Good Friday to Easter Monday. From April 19th to April 22nd, the store will be closed. We have free parking behind the building - see all the details at the bottom of the page. Our offices are conveniently located near downtown Montreal at 4020 St-Ambroise in the St-Henri neighbourhood, a few blocks west of the Atwater market. The closest Metro Station is Place St-Henri on the orange line. 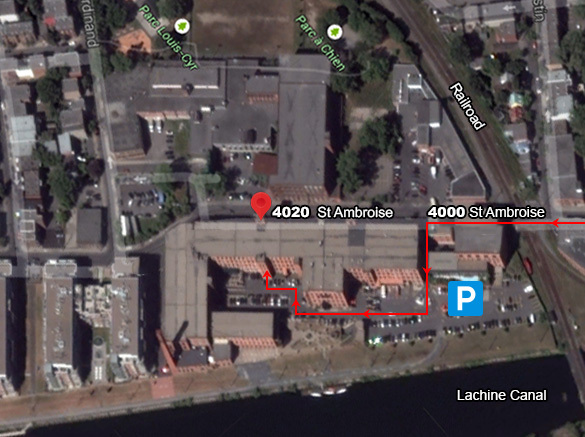 If you come by car, note that the Parking’s entrance is next to the 4000 St-Ambroise. Pass the gate and get a ticket, parking is free for the first 30 minutes. Go right and enter the building through the side door, suite 145 will be on your right.